to head to Las Vegas for the latest international pet trends. Bring the Hottest New Trends Home and Get a Leg Up on Your Competition When You Attend North America’s Leading Pet Retail Event. 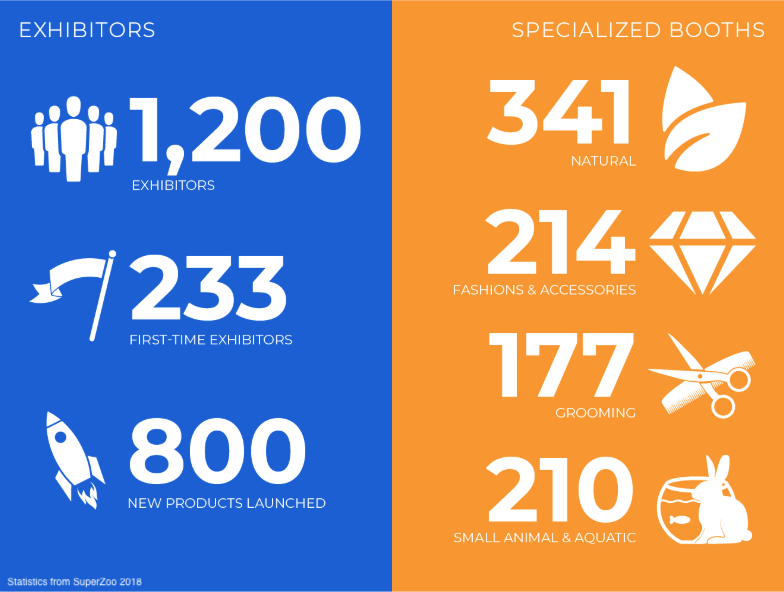 Why do more pet retailers around the world flock to SuperZoo than any other show in North America? Because it’s renowned as the epicenter of U.S. pet trends—as well as a prime source of deals on new products, including many that can’t be found anywhere else. That’s because the more than 1,100 leading manufacturers and suppliers who exhibit at SuperZoo showcase best-selling merchandise and debut products the local competition won’t have on their shelves—so you can return home with unique items that truly set yours apart. 850 NEW products making their world debut in the New Product Showcase. A Made in the USA Showcase filled with American-made pet products. A Pet Tech Center featuring cutting-edge pet products from Bluetooth-enabled gear to robotic and pet-activated devices. Five specialty neighborhoods covering every aspect of pet retail: fashion and high-end accessories, natural and eco-friendly products, grooming supplies, small animal and aquatic products and more. An International Lounge offering help with the SuperZoo mobile app and featuring interpreters for Spanish, Mandarin and Korean. This lounge also features complimentary water service, charging stations and table seating. NEW innovators and entrepreneurs showcasing their products for the first time in the New Exhibitor Row neighborhood. The pet industry’s best education program, offering more than 80 seminars spanning 85 education hours. Relationship-building with more than 21,000 pet industry professionals, including more than 1,200 international buyers. There’s no better place to hold North America’s favorite pet retail trade show than the entertainment capital of the world—Las Vegas! Make sure to book your travel and hotel accommodations soon for best rates. To request a Letter of Invitation please submit this form.